The reign of George V started with all the colourful elegance of his father Edward VII, but he was about to enter a period in history that took this country and the world apart. 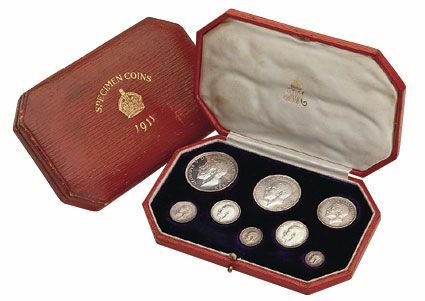 We have a few of these eight coin silver Coronation sets, halfcrown to maundy penny complete in their original Royal Mint boxes. Superb condition, a neat and elegant set.